School is out, which means it’s summer and time to relax. While many families are tempted to take time off from anything resembling schoolwork, it’s important to recognize that research shows summer learning loss typically equals at least one month of instruction. Fortunately, a fun-filled break doesn’t have to come at the cost of your child regressing in his education. Balancing a relaxing summer while building upon all that was learned during the academic year may seem like a daunting task. At the end of the day, however, you are your child’s ultimate teacher and already possess the tools to ensure he makes steady progress. Literature and meaningful dialogue are the keys to creating an effective reading program at home. If kids are headed to camp, send them off with some new or used books. Also, talk to counselors about encouraging your youngster to read. A reading-friendly house is more than just designating a specific time and place for literature. Here are some helpful suggestions to follow. Establish a good reading nook with your child’s participation. It should be comfortable, quiet and private so busy family members aren’t a distraction. Let your child personalize the area, maybe with a special pillow or blanket. Put a selection of books nearby, perhaps in a crate or on a bookshelf. And ensure lighting is adequate. Make reading materials readily available. 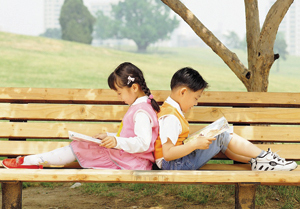 Set a time when family members can read together or alone. Have regular conversations about books, newspapers, magazines, movies and quality television programs. Often, parents put too much thought into the selection of “good” books for their kids. The truth is that children know what intrigues them, and summer is an ideal season to let kids explore their interests. Offer a limited selection of books recommended by a bookstore, library or website, such as www.ourhomeworkhelper.com/blog. However, allow your child to make the final decision. This makes him feel empowered and nurtures his willingness to read. Sometimes, though, kids choose books that are too challenging for independent reading. A smart strategy for determining whether a selection is appropriate is the five-finger rule. Open the book to a random page and have your child scan the page. Every time a word is missed, one finger goes up. If all five fingers are up before the page is finished, then new options should be selected. True reading is defined as the ability to attach meaning to the printed word, not just to say the words aloud. Likewise, the ability to demonstrate comprehension is crucial when implementing a summer reading program to fight brain drain. The most effective way to check that your child understands the material is by asking worthwhile questions. Making connections between content and personal experiences deepens kids’ thinking as well as encourages their desire to learn more, which leads to reading more. And developing connections easily occurs during conversations. So, parents, offer stories, share your thoughts, encourage family reading time and listen to your little ones. Not only are you preventing summer learning loss, you’re building the foundation for a lifelong love of learning for your children. About the author Elaine Meyers, M.Ed.